Have Westworld Fans Uncovered the Man in Black’s Identity? The first two episodes of HBO’s new sci-fi series Westworld offer more questions than answers: Where is the park located? Could a park guest harm another guest (with something other than a gun)? How does Dolores’s hair stay so perfect without hairspray? One of the biggest mysteries, though, is the identity of a character known only as “the Man in Black” (played by Ed Harris). After watching “Chestnut,” the second episode, some fans think they’ve figured it out. One popular fan theory making the rounds posits that William, the park newbie introduced in “Chestnut” (played by Jimmi Simpson) is a younger version of the Man in Black. This would mean that, despite some clever editing, the scenes featuring William take place 30 years before the show’s main action (because in Episode 1, the Man in Black tells Dolores, “I’ve been coming here for 30 years”). - The Westworld William and Logan visit looks different than the one we’re used to: Namely, the Westworld logo William walks by in the main lobby is not the one we’ve seen in the Delos offices; Teddy (James Marsden) doesn’t appear to be on the train to the park; and a group of Union soldiers, rather than the Sheriff, is looking for volunteers in the town square. - The gleaming escalators leading from the train platform were shown in the first episode—as decrepit and long out of service (see below). Naysayers of this theory put forth as counter evidence that the hosts were much cruder at the park’s inception (for example, Old Bill, whom Dr. Robert Ford talks to in the first episode), and the ones in William’s present are difficult to distinguish from real people. This might be true, but we don’t actually know how old the park is. 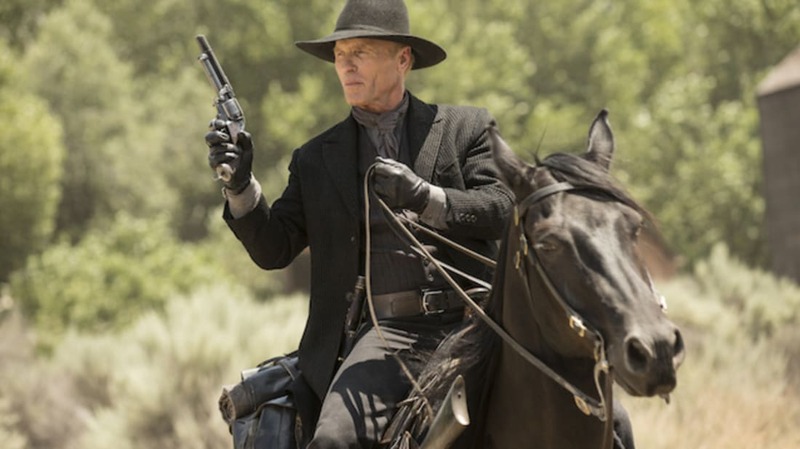 The Man in Black has been visiting for 30 years, but Westworld could very well be much older than that. If the park is 50 years old, for instance, Ford and his team would have been updating the hosts for two decades before William/the Man in Black first arrives. And, since we know that Dolores was the park’s first host, we know that Ford likes to improve existing hosts, rather than swap them out with new ones. If this theory is true, it means we can look forward to watching William devolve from the white hat-wearing hero to a cruel and violent gunslinger.